SULLIVAN CITY — Former Palmview City Manager Ramon Segovia, who was terminated from the city in 2017 in the aftermath of a critical report on the city’s administration, was hired by Sullivan City as a consultant. The city council approved to contract with Segovia to assist with the annual budget, the Community Development Block Grant program, the Economic Development Corporation, city departments and overseeing day-to-day activities, according to a description of his services. There was also talk during the meeting of moving toward converting the city’s Economic Development Corporation into a Municipal Development District, a move Palmview made during Segovia’s time there. Such a move requires voter approval. An MDD can impose sales and use tax, which can be collected from a city’s extra-territorial jurisdiction. Segovia said he could begin work on this immediately. The council unanimously approved to contract him on a month-to-month basis and to compensate him $3,000 per month. Segovia will be working with City Secretary Veronica Gutierrez and Police Chief Richard Ozuna, who has been serving as interim city manager in a dual capacity. When the council members were asked during public comment whether they might eventually bring on Segovia permanently as the new city manager, Mayor Leonel “Leo” Garcia said the possibility had not been discussed at that point. But if the position were ever offered to him, Segovia said he would be willing to discuss it with city officials. Accepting the role would be his second stint as city manager after serving in the same position for the city of Palmview since 2013. 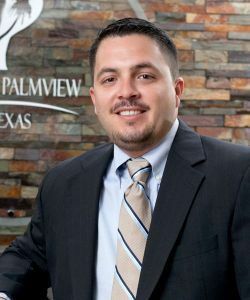 Segovia was terminated as the Palmview city manager in June 2017 following a review of the city’s policies and procedures conducted by a management consultant, Paul Vazaldua of Vazaldua and Associates. The management review was promoted after the election of three new council members, which changed the power structure of the council. The new members — Javier Ramirez, Linda Sarabia and Joel Garcia — said the purpose of the review was to get an idea of what was happening within the city. Vazaldua presented to the council that the administration lacked certain policies and procedures, such as proper hiring and procurement policies as well as job descriptions. The policies and procedures manual had not been updated since March 2000, according to Vazaldua. Segovia was subsequently placed on leave in April 2017 for about two months before his termination. He has since filed a lawsuit against Palmview for breach of contract, and it remains pending. Ozuna said the circumstances of Segovia’s departure from Palmview did not play into his decision to bring him on. Ozuna said Segovia had previously assisted Sullivan City in preparing the budget earlier this year, adding that they worked well together. For his part, Segovia said he likes the environment and sees potential in Sullivan City.